Many people believe that they have experienced paranormal phenomena and others claim to possess psychic abilities. For the past hundred years or so, researchers have undertaken systematic and scientific work into these alleged experiences and abilities. This collection of articles provides readers with a general sense of the methods used in this research, the findings that have been obtained and the controversies generated by this work. They cover a wide range of issues, including the psychology of paranormal belief, investigations into ghosts and hauntings, laboratory research into extra-sensory perception and psychokinesis, and controlled tests of psychics and mediums. An introductory essay sets each of the selected papers in context and provides additional references for those wishing to delve deeper into the issues surrounding each of the areas covered. Contents: Introduction: Outside the Lab: Paranormal Beliefs and Experiences: A community mail survey of psychic experiences, John Palmer ; Psychology and coincidences, Caroline A. Watt; Fantastic memories: the relevance of research in to eyewitness testimony and false memories for reports on anomalous experiences, Christopher C. French; Birthmarks and birth defects corresponding to wounds on deceased persons, Ian Stevenson; Near-death experiences in survivors of cardiac arrest: a prospective study in the Netherlands, Pim van Lommel, Ruud van Wees, Vincent Meyers and Ingrid Elfferich; An investigation into alleged 'hauntings', Richard Wiseman, Caroline Watt, Paul Stevens, Emma Greening and CiarÃ¡n O'Keeffe; The 'Brother Doli' case: investigations of apparent poltergeist-type manifestations in North Wales, Michael Daniels. 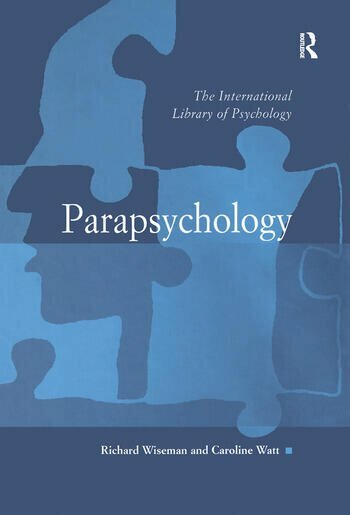 Testing Psychic Claimants: A brief overview of magic for parapsychologists, George P. Hansen; What is your counter-explanation? A plea to skeptics to think again, John Beloff ; The appearance and disappearance of objects in the presence of Sri Sathya Sai Baba, Erlendur Haraldsson and Karlis Osis; The psychic reading, Ray Hyman; An overview of quantitatively evaluated studies with mediums and psychics, Sybo A. Schouten. Extrasensory Perception: Experiments bearing on the precognition hypothesis: I, pre-shuffling card calling, Joseph Banks Rhine; Methodological criticisms of parapsychology, Charles Akers; Psychology and anomalous observations: the question of ESP in dreams, Irvin L. Child; Does psi exist? Replicable evidence for an anomalous process of information transfer, Daryl J. Bem and Charles Honorton; Should ganzfeld research continue to be crucial in the search for a replicable psi effect? Part I, discussion paper and introduction to an electronic mail discussion, Julie Milton. Psychokinesis and Distant Mental Influence: Experimental investigation of table-moving, Michael Faraday; A PK test with electronic equipment, Helmut Schmidt; Evidence for consciousness-related anomalies in random physical systems, Dean I. Radin and Roger D. Nelson; Further studies of autonomic detection of remote staring: replications, new control procedures, and personality correlates, William Braud, Donna Shafer and Sperry Andrews; Experimenter effects and the remote detection of staring, Richard Wiseman and Marilyn Schlitz; The efficacy of 'distant healing': a systematic review of randomized trials, John A. Astin, Elaine Harkness and Edzard Ernst; Give the null hypotheses a chance: reasons to remain doubtful about the existence of psi, James E. Alcock. Experimenters' Personal Perspectives: The elusive open mind: 10 years of negative research in parapsychology, Susan Blackmore ; Boundless mind: coming of age in parapsychology, Marilyn Schlitz; Name Index. Richard Wiseman is Professor at the Department of Psychology, University of Hertfordshire, UK. Dr Caroline Watt is from the School of Philosophy, Psychology and Language Sciences, University of Edinburgh, Scotland.